Food 4 Less is a subsidiary of the Kroger supermarket. It has a classic and very similar product range to the Kroger-related markets like Ralphs, Fry’s. Browse the latest Food 4 Less Ad on this page and subscribe to get the newsletter about the new deals in the future, too. You will find deals like mix and match sales, BOGOs, weekly price drops on products of the bakery, deli, seafood, frozen food, breakfast, snacks, beverage, and more categories. The other name of the Food 4 Less stores is Foods Co. and you may encounter them in Northern or Central California. The retailer operates in California, Indiana, Ohio, and Illinois. It’s a part of one of the biggest retailers in the United States and the world. 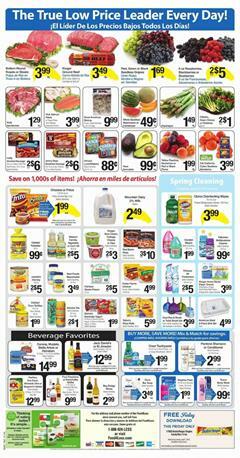 Browse the Food 4 Less Weekly Ad to see great discounts of mentioned categories. Great services, reward programs, and alternative solutions for weekly savings are possible to find in the Food 4 Less stores. Fuel savings, regular promotions, digital coupons, online orders, are some of these. One of the best deals of the March sales of Food 4 Less Weekly Ad is a 7-day digital coupon offer. You may use the coupon up to 5 times. For example, you'll be able to buy Kool-Aid Jammers for only $.79 with using the coupon. There are also great fresh product items. Roma tomatoes and Fresh Foster Farms chicken drumsticks are two typical products from the category of fresh food. Food 4 Less also offers multiple-buy - or we can even call them bulky-buys - deals on this ad. Buy 15 Powerade to pay only $.59 each. 3 Pepsi or Squirt will cost $2.99 ea. Special offers from the Ad can also be for your purchases of non-food items. Personal care products like shampoo, toothpaste, and Dove soap are among those. 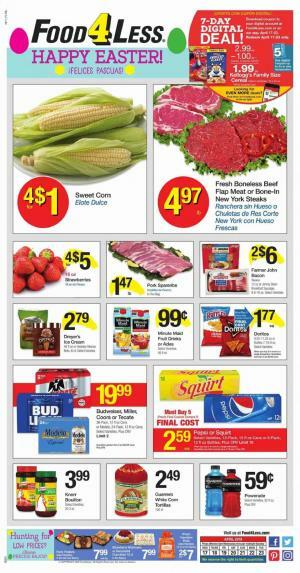 A mix and match deal is on pg 2 of the latest Food 4 Less Ad. Check out this page regularly to see any new Ad is available. Alternatively, you can follow our Facebook page to get news about these posts. Pink Salmon Fillets or Tilapia Fillets $3.99/lb.